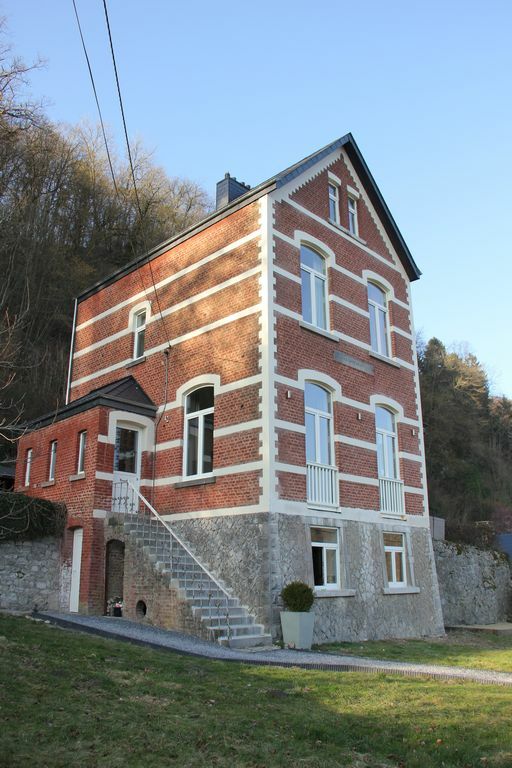 Fully renovated 1900's villa within 300m of Durbuy center! Villa Louise is the most beautiful holiday home in the Ardennes. It s a house with a history, built around 1900 by a widow called Louise to enjoy her retirement in the beautiful surroundings of Durbuy. Located in a quiet street just 300m from the historic center of Durbuy, the smallest city in the world, it is ideally located to discover the town and its surroundings. Since April 2014, the house has been available for holiday rentals. It s the perfect location for a weekend getaway! Guests have access to the entire house and garden. The house is located on a hill and has a stair access, so it might be less suitable for the elderly. The house is available on a weekend, midweek and week basis. Other periods can be discussed. When renting the house for the weekend (Friday to Sunday), check-out is possible until 7pm without extra charge. Villa Louise is conveniently located 300m outside of the historic center of Durbuy. This means you can benefit from a quiet stay and a green environment, but you are also able to walk to the town center to enjoy the many restaurants and boutiques. In the summer time the narrow streets will make you feel like you’re in a picturesque little village in the Mediterranean. In winter time you can stroll on the cosy Christmas market of Durbuy and enjoy mulled wine and local delicacies. Durbuy is a great starting point to explore the Ardennes region and do outdoor activities like walking, kayaking, mountainbiking etc. You ll find our best picks of restaurants, walks and other things on the website of Villa Louise Durbuy (click "Blog", or in the folder in the house. 300m from Durbuy, a very cosy medieval town with plenty of restaurants and bars. Bedroom 4 has a retro-gaming corner with Sega Master Sytem, Super Nintendo and PS2. There is a flight of stairs to reach the house. Several stair required to reach the bedrooms.